Max Berger for the Applicant. KELEN J.:– This is an application for judicial review of a decision by a Pre-Removal Risk Assessment (PRRA) Officer, dated April 30, 2008, denying the applicant’s application for protection because of the availability of state protection. 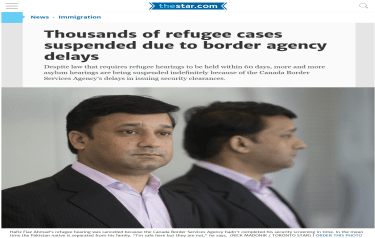 The applicant, a 44 year old citizen of Pakistan, arrived in Canada on July 27, 2001 and filed a claim for refugee protection. The applicant’s refugee claim was based on fear of persecution from a banned Sunni Muslim religious group named Sipah-e-Sahaba (SSP). The applicant alleged that SSP was targeting herself and her husband because of their religious activities on behalf of the Shia Muslim community in Pakistan. (Note: The applicant’s own evidence indicates that she subscribed together with her husband to “extreme Shia” beliefs. She also indicates that her husband was the driving force behind those activities.) The applicant argued in front of a three-member panel of the RPD that she was forced to flee to Canada from Pakistan while her husband fled to the United Arab Emirates (UAE). The applicant’s refugee claim was denied by the Refugee Protection Division (RPD) of the Immigration and Refugee Board on July 16, 2003 on the basis of lack of credibility and the availability of adequate state protection. The applicant failed to provide objective documentary evidence to corroborate the alleged six SSP attacks. When the claim was heard, the RPD held that country conditions in Pakistan have improved since 2001 such that the applicant would able to avail herself of state protection. The applicant’s application for leave to apply for judicial review was denied. The applicant filed a PRRA application on July 31, 2007 and later updated it with supplementary materials and submissions. On February 4, 2009 the applicant received a negative PRRA. On April 27, 2009, the applicant was granted a stay of deportation by Justice Anne Mactavish. The applicant submitted extensive materials in support of the same allegations of risk that were alleged in front of the RPD and new allegations of risk from the applicant’s husband. The PRRA officer states at page 2 of the decision that the applicant’s submissions included items that pre-dated the RPD decision and were therefore not considered pursuant to subsection 113(a) of the Immigration and Refugee Protection Act (IRPA) S.C. 2001, c. 27. Any evidence with respect to the new fear of violence from the applicant’s husband and his family was considered as new evidence. The officer determined that the risks of persecution by the SSP were fully dealt with by the RPD. In addition, the country conditions with respect to religious violence have not deteriorated. The applicant did not challenge this part of the PRRA decision before this Court. The applicant submitted that since March 2006 her husband and his family have declared the applicant to be a source of shame and dishonour to their family by her act of touching other men’s hair in the course of her employment. They are also alleged to have become erroneously convinced that she is living with another man in Canada when a male guest of the applicant answered the phone at her apartment. If returned to Pakistan, the applicant alleged that she will be subject to an “honour killing” at the hands of her husband’s family. The officer reviewed the applicant’s new allegations of risk from her husband and his family. The officer noted the following supporting documents: an affidavit dated January 17, 2009 from the applicant’s brother, Mr. Arif Mehmood; a letter dated April 24, 2008 from the applicant’s cousin, Sher, and a copy of clinical notes dated April 10, 2008 from the Shaukat Clinic in Rawalpindi that describe injuries sustained by Mr. Mehmood. Mr. Mehmood’s Affidavit described an incident where he was attacked by the applicant’s in-laws after he refused to help lure the applicant back to Pakistan so that she may be killed. Sher’s letter is a second hand description of Mr. Mehmood’s attack. The officer accepted that Mr. Mehmood was attacked, however, the officer found that that it did not provide objective documentary evidence to support that the applicant faces hardships at the hands of her husband or his family upon return to Pakistan. The officer reasoned that the evidence failed to explain how Mr. Mehmood or Sher came to know that that the applicant’s in-laws perpetrated the attack on Mr. Mehmood. The officer assigned a low weight to Mr. Mehmood’s Affidavit because of his failure to report the assault to the police. The officer identified an inconsistency with regard to the location of the applicant’s husband because some of the documentation indicated that he left the UAE and returned to Pakistan in 2004, and then moved to the UAE again; however the updated PRRA submissions and application form listed the husband’s whereabouts as unknown. The officer assigned no weight to a newspaper article that mentioned the applicant because it was not corroborated with objective documentary evidence. The officer reasoned that it was not difficult to create false newspaper reports in “notoriously corrupt” Pakistan. The applicant submitted a number of allegedly threatening letters. Two of the letters were sent to the applicant from her husband. One letter was sent from the applicant’s husband to the applicant’s brother. One letter was sent from the applicant’s brother in-law to her. The evidence before me indicates that the applicant’s husband sought a reasonable explanation from the applicant for the male answering the telephone. It is noted that her statement explains that the male individual that answered the phone was her friend’s husband, who was at her residence repairing the computer. The evidence before me indicates that the applicant provided this reasonable explanation to her husband. The evidence before me does not support that this explanation was rejected by the applicant’s husband, or that he seeks to harm her as a result. The officer proceeded to consider state protection as the determinative issue in this PRRA. The officer considered the objective country condition documentation with a view to the current and future efforts of the Government of Pakistan to combat domestic violence and “honour killings”. He concluded that Pakistan made serious efforts to combat “honour killings” and domestic abuse and was providing adequate, if imperfect, state protection. The officer determined that the applicant failed to link the general country conditions in Pakistan to her personalized and forward-looking risk. The officer determined that the applicant failed to provide objective documentary evidence to support her profile as similar to those persons that are currently at risk of persecution or harm in Pakistan. The officer then considered the treatment of Shia Muslims by the Pakistani Government and the advances in the way the state treated victims of domestic abuse. He concluded by noting that Pakistan is a democracy with a functioning judiciary and multiple levels of state protection that would be available to the applicant. The officer concluded that the evidence before him did not support the applicant’s submissions that she is of interest to the SSP or her husband and his family. The PRRA application for protection was therefore denied. The applicant restricted her argument to the reasonableness of the PRRA officer’s determinations with respect to the new events which post date the RPD decision, namely the risk of persecution by the applicant’s husband and his family. It is clear that as a result of Dunsmuir and Khosa that questions of the reasonableness of a PRRA officer’s factual determinations are to be reviewed on a standard of reasonableness (see also Christopher v. Canada (MCI), 2008 FC 964, Ramanathan v. Canada (MCI), 2008 FC 843 and Erdogu v. Canada (MCI), 2008 FC 407,  F.C.J. No. 546 (QL)). In reviewing the officer’s decision using a standard of reasonableness, the Court will consider “the existence of justification, transparency and intelligibility within the decision-making process” and “whether the decision falls within a range of possible, acceptable outcomes which are defensible in respect of the facts and law.” (Dunsmuir, supra at paragraph 47, Khosa, supra, at paragraph 59). Issue: Did the officer make an erroneous finding of fact in a perverse or capricious manner without regard to the evidence? The applicant challenges several factual determinations made by the PRRA officer which formed the basis of the negative PRRA. The applicant contends that these factual determinations were erroneous, and made in a manner that was capricious or without regard to the evidence. Accordingly, these findings were not reasonably open to the PRRA officer. The respondent submits that the applicant disagrees with the officer’s weighing of the evidence, a function that is strictly within the purview of the PRRA officer conducting the assessment. The respondent submits that the PRRA officer reasonably determined the credibility of the applicant’s documents and made reasonable findings on fact with respect to the applicants risk and state protection. In Kaybaki v. Canada (Solicitor General of Canada), 2004 FC 32, I held at paragraph 5 that “the decision of a PRRA officer is to be accorded deference since it involves findings of fact. However, a PRRA officer’s decision must be supported by the evidence”. The onus is clearly on the applicant to demonstrate that the PRRA officer’s findings were not supported by the evidence on the record (Malshi v. Canada (MCI), 2007 FC 1273, per Justice Shore at paragraph 18). The first impugned finding of fact is found at paragraph 3 of the decision where the officer rejects Mr. Mehmood’s Affidavit as objective documentary evidence to support that “the applicant faces hardship at the hands of the husband or his family” if removed to Pakistan. The officer reasoned that the documents do not explain how Mr. Mehmood knows that the attack on him was related to the applicant, or that the husband or the in-laws were involved. … my sister’s in-laws and her husband believed she is living against Shariah Law with some male person in Canada. Her in-laws often cursed me on phone (sic) and called me coward and provoked me to declare my sister as a curse and disgrace woman to family and asked me to join hands with them, call her back to Pakistan and kill her. On my refusal they (in-laws) threat (sic) me to face the severe consequences and physical damages to me and my family. On April 10, 2008 some of her in-law relative (sic) attacked me and injured me. I am worried and scared of my safety as well as Roohi’s they will not spare her life. I strongly believe they (in-laws) determine to kill her in the name of honour-killing…it is decided to kill Roohi whenever they find her. I am scared if she comes back she will be victim of this barbaric custom, which is performed conservative families like her in-laws. The documents provided do not explain how they have come to know that the attack on Arif Mehmood was related to the applicant, or that her husband or in-laws were involved. is unreasonable based on the Court’s reading of the same documents. The applicant contends that the officer erred in faulting the applicant for failing to provide objective documentary evidence such as a police report about this April 10, 2008 attack. The absence of a police report was explained, yet dismissed by the PRRA officer without any reasons. There was no report to the police because, according to the explanation, the applicant’s brother did not want “more trouble” with the applicant’s husband and his family, and the police would not take any action in any event (presumably because it is a domestic matter). The applicant impugns the officer’s findings of fact of fact with respect to the letters sent by the applicant’s husband to the applicant’s brother. The officer determined at page 5 of the decision that correspondence sent by the husband did not disclose an intention to harm the applicant. Rather, the correspondence shows that the husband sought an explanation for why a man answered the applicant’s phone in her apartment. The officer determined that the applicant provided a reasonable explanation to her husband, and that the evidence did not support the applicant’s contention that her explanation was rejected. … All family members are very annoyed, which can be turned into revenge … you also know very well that if we turn ourselves to take revenge, we can be proven as the worst enemies. I arranged your escape for your safety and now you looking for divorce. My doubts about you are real and right but keep this in mind that now I will finish you myself. … They believe Roohi is living against Shariah Law of Islam. She has illicit relation with someone in Canada. She is living a free woman life in Canada. This justifies them to kill her in the name of honour so they can live a heads up life. The situation over here has become very drastic for Roohi as her in-law declares her Kari. I am dead sure that she will be killed instantly if she comes back to homeland. On reviewing this evidence the Court must conclude that the PRRA officer’s finding that the applicant was not being threatened by her husband with an “honour killing” if she is returned to Pakistan cannot be sustained as reasonably open to the PRRA officer. Rather, the PRRA officer cannot deal with these threatening letters by mischaracterizing the letters as not threatening. Rather, the PRRA officer must decide that if these letters are true or fraudulent or not credible. Since the credibility of these many documents which purportedly threaten the applicant must be assessed, the PRRA officer may wish to convoke a hearing with the applicant to assess her credibility and the credibility of the letters and other documents which could be found to be true, or could be found to be self-serving for the purpose of the applicant remaining in Canada. With respect to state protection, the applicant submits that the PRRA officer’s conclusion that state protection would be available to the applicant is contradicted by the evidence. “Honour killings” continue to be a serious problem in Pakistan notwithstanding the Government’s efforts. Honour killings continue to be a problem, with women as the principal victims. During the year local human rights organizations reported between 1200 and 1500 cases. … Many more likely went unreported. According to the objective country evidence, the Government is not able to control “honour killings”, and cases of domestic abuse “are rarely acted upon as the police and judges view it as a family problem”. For these reasons, the Court concludes that the PRRA officer made unreasonable findings of fact with respect to the threats against the applicant in the documents, and that if the applicant is credibly found to be threatened with an “honour killing” upon her return to Pakistan, then the objective country evidence shows that the Government of Pakistan is not able to provide adequate state protection against “honour killings” in that the U.S. Department of State reports 1200 to 1500 honour killings took place in Pakistan in 2007 notwithstanding Government efforts to protect women. Accordingly, the Court will set aside the PRRA decision and refer the matter back to another PRRA officer with the direction that the PRRA officer may convoke a credibility hearing to determine if these documents containing the threats are credible, or self-serving documents created by persons close to the applicant to buttress her case to be allowed to remain in Canada. Both parties advised the Court that this case does not raise a serious question of general importance which ought to be certified for an appeal. The Court agrees. The application for judicial review is allowed, the PRRA decision is set aside, and the PRRA application is remitted to another PRRA officer to redetermine if the documents are credible, and if this PRRA application should be allowed or dismissed.